Pull the trigger and hold it back. Push forward on the cocking indicator till it has rotated completely forward. Release trigger. Open the operating lever 1/2" or so. 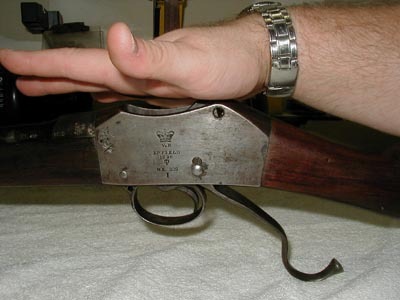 Insert the breechblock into the action body front first. 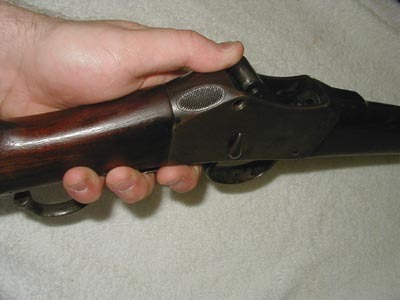 At this point, the rear hump of the breechblock will protrude from the top of the action body. Notice how I keep my little finger between the operating lever and buttstock to keep the lever open 1/2". 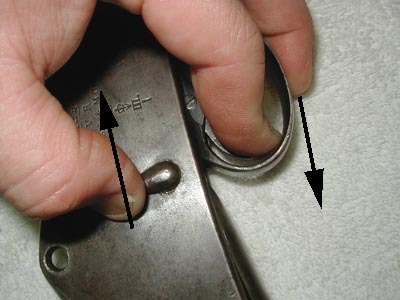 Using the heel of your hand, press on the rear of the breechblock, and at the same time slowly open the lever. 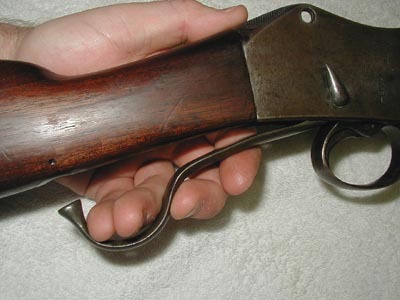 The breechblock should spring into place. Sometimes a bit of fidgeting is necessary to pop the block back in. I've found the best way is to keep pressure on the rear of the breechblock while you slowly move the operating lever up and down. You'll easily be able to tell when the tumbler engages the slot in the striker, and the block pops into place. 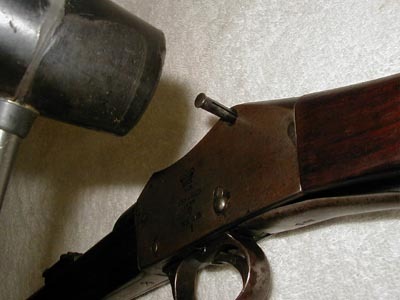 Reinstall the breechblock split pin with a rubber or wood mallet, test for proper operation, by cocking and dry firing (preferably with a snap cap in the chamber and the weapon pointed in a safe direction).